Spurt into the Arctic will ensure revival of the Northern Sea Route. "We're going to make the Northern Sea Route one of the world's key trade highways", said recently Russian premier Vladimir Putin at the International Arctic Forum in Arkhangelsk. The way from Asia-Pacific region to Europe via Arctic is one third shorter than the traditional southern route. Independent experts confirm importance of the Northern Sea Route development, although doubt such large-scale project would be adequately financed and implemented. "Northern Sea Route will acquire global scale and value", said Vladimir Putin in Arkhangelsk. He stressed that Russia perceived future of the Northern Sea Route just as international traffic artery capable to "compete with traditional sea lanes in service costs, in security, and in quality". "The shortest way between largest markets of Europe and Asia-Pacific region goes through the Arctic, and it is almost one third shorter than traditional southern route. It is a good opportunity to optimize transportation costs, so those countries and private companies choosing Arctic shipments will undoubtedly receive weighty economic advantages and benefits", Putin said at the Arctic Forum arranged by Russian Geographical Society (RGS). "Northern Sea Route shortens about 34% of the sea way between Europe and Asia reducing travel time by almost two weeks. Besides, "there are no pirates", said Arthur Chilingarov, RGS chief executive and presidential envoy for Arctic cooperation the day before forum in the interview to RIA Novosti. However, during the 'perestroika' volume of cargo traffic at the Northern Sea Route reduced from 6.7 mln tons in 1987 almost to zero and resumed only in 2000. According to Rosatomflot, today freight traffic grows up having exceeded 3 mln tons in 2010 when icebreaking escorts of large-tonnage tankers were resumed. Nevertheless, the government is going to change the situation. According to Vladimir Putin, the world's largest oil platform Prirazlomnaya has been already settled in the Pechora Sea. "In fact, Russia does start development of the Arctic shelf and opens a new chapter in the history of Arctic exploration", he said. "Next come starting-up of Stockman oil field in the Barents Sea, development of hydrocarbon reserves in the Kara Sea and around the Yamal Peninsula", added Putin. Moreover, minister of transport Igor Levitin pointed out that "the three-year federal budget provides RUR 20 bln for construction of new-generation icebreakers". 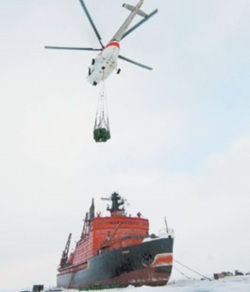 As was earlier reported, Russian shipyards would build three nuclear and three diesel electric icebreakers. Meanwhile, volume of cargo traffic on the Northern Sea Route could reach 75 mln tons by 2020, said deputy minister of regional development Alexander Viktorov. "In case of steady development of the Northern Sea Route, by 2020 cargo traffic would be at least 30 mln tons there or even could reach 75 mln tons", he said. "This would transform maritime freight services into the second largest item of income after oil export in the Arctic Zone". According to the official, Ministry of Regional Development has worked up modernization strategy for Arctic transport system, and the key role is given just to the Northern Sea Route. The cause for such insufficient use of this route – lack of transport infrastructure in the Arctic – is said to be eliminated. According to the secretary of Russian Security Council Nikolai Patrushev, the question is "creation of transport and logistic facilities" along the Northern Sea Route. However, ecologists warn that industrial development of the Arctic must be conducted with extreme care. As for them, this region is one of the most sensitive to climate changes. "What proves that most illustratively is ice cover reducing in recent decades. In 2011, the record of 2007 was equaled: in September 2011 the space of ice cover was only 4.2 millions of square kilometers", said press release published by Russian branch of World Wildlife Fund prior to the forum. 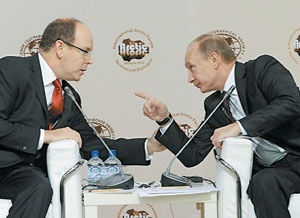 Such view is definitely shared by Prince of Monaco Albert II who also took part in the forum. According to independent experts, there is no point of waiting for fast economic effect from Arctic exploration. But strategically, this is not a reason to back down from it. "Speaking of a specific project of the Northern Sea Route revival, everything depends on volumes – if the traffic is mass, that would be economically sound. But do not count on fast economic effect in this issue", said Dmitry Alexandrov, Univer investment company. Besides, from the viewpoint of strategy, development of the Northern Sea Route is essential. "If treating this issue appropriately and setting up required infrastructure, one could establish new large sector in economy", assured Alexandrov.